We might be too deep into the NBA season for any of Doc's affiliated sportsbooks to post a "Next NBA Coach to be Fired" prop, but I could be wrong. Milwaukee gave Jason Kidd the pink slip on Monday (Kidd is the third coach fired so far this season), which was a dangerous choice because superstar Giannis Antetokounmpo reportedly loved Kidd and offered to try and save his job with ownership. You never want to upset your franchise player, especially when you are a small-market team lucky enough to even have one. The Bucks' future is a story for another day, but I believe there's one clear-cut favorite for the next coach to be fired: Washington's Scott Brooks. The Wizards look completely disinterested whenever they play away from home or against a team with a losing record. They are closer to missing the playoffs than they are to the second seed and are apparently in-fighting. No club with John Wall, Bradley Beal, Otto Porter and a few other decent players should struggle this much. Brooks recently ripped his guys publicly in the Washington media following a bad loss, saying: "We're just going to have to find guys who are going to compete. It's not about nothing else. It's not about shots. It's not about how many minutes. It's not about how many shots you get. It's about competing." It's a coach's job to get his players motivated, and he's not doing it except for when the Wizards play marquee competition. Get your resume ready, Mr. Brooks. Sacramento ended an eight-game losing streak with a 105-99 victory in Orlando on Tuesday. With rookie De'Aaron Fox leaving early with abdominal tightness, seldom-used Garrett Temple blew up with a career-high 34 points, 19 in the fourth quarter. Temple scored all of Sacramento's points during a 17-6 run that put the Kings ahead 103-97 with 23.5 seconds to go. Fox is considered day-to-day. Miami completed a five-game road trip Monday at 2-3 with a 99-90 loss in Houston. Hassan Whiteside led the Heat with 22 points and 13 rebounds. 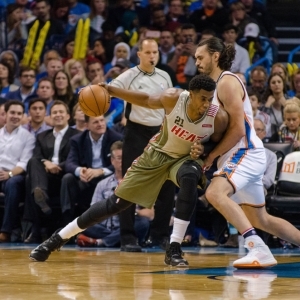 Starting point guard Goran Dragic was out a second straight game because of a bruised left knee. Tyler Johnson missed a fourth in a row with an ankle issue. The Kings were swept by the Heat last year and have dropped 15 straight in south Florida. They are 3-26 all-time there. Key trends: The Kings are 1-5 against the spread in their past six after a win. The Heat have covered seven straight following a loss. The "over/under" has gone over in the past seven meetings in Miami. Early lean: Wait on Dragic and to a lesser extent Fox. First of a TNT doubleheader. This is a marquee opponent and a national TV game so maybe the Wizards show some effort. They sure didn't Monday in a ridiculous 98-75 loss to a Mavericks team that might be the least-talented club in the Western Conference. Wall (he was a game-time call with migraines) and Beal combined for just 29 points on 8-for-29 shooting. The Wizards also missed 11 of 27 free throws - that's a lack of focus. Porter left with a right hip strain and didn't return, so he's iffy here. The Thunder won a fifth straight on Tuesday, 109-108 over visiting Brooklyn. Russell Westbrook hit the go-ahead layup with 3.3 seconds left as OKC rallied from a 15-point hole in a clear letdown game. Westbrook had 32 points and Paul George added 28 points and nine rebounds. Washington and OKC split two high-scoring games last year, each winning at home. They play again next Tuesday. Washington hasn't won on the road in this series since OKC's Seattle days. Key trends: The Wizards are 1-8 ATS in their past nine. The favorite is 4-0 ATS in the past four meetings. The over is 5-1 in the previous six. New York lost 123-112 at Golden State on Tuesday. Kristaps Porzingis was a late scratch with knee irritation. It was the Knicks' sixth game in eight nights as they are running on fumes in this seven-game road trip. Denver beat visiting Portland 104-101 on Monday. Jamal Murray had a career-high 38 points, including a go-ahead 3-point play in the final minute. Nikola Jokic had 16 points and 12 rebounds, while Wilson Chandler came off the bench for the first time this season. The Knicks beat the visiting Nuggets on Oct. 30, 116-110. Porzingis had 38 points on 14-for-26 shooting. However, New York has lost nine straight in Denver. Key trends: The home team is 6-2 ATS in the past eight meetings. The under has hit in six straight Nuggets home games. Early lean: Wait on Porzingis. Potential conference semifinals or finals preview and the second TNT game. Unfortunately, we don't know if Jimmy Butler will play as he was questionable to return from a sore knee Wednesday night at Portland. Golden State yet again avoided back-to-back losses as off Saturday's defeat in Houston it beat the visiting Knicks on Tuesday, 123-112. Stephen Curry had 32, seven assists and six rebounds. Kevin Durant got a rare ejection due to a pair of technical fouls. The Warriors have won three straight at home in this series, including 125-101 on Nov. 8. Klay Thompson had 28 points and Curry 22 points, eight assists and eight rebounds. Durant was out injured. Butler had just 11 for the Wolves. Key trends: The Wolves are 5-1-1 ATS in the past seven meetings. The over is 7-1 in the Warriors' past eight vs. the West.